The True Duty of a Shinobi! Before getting into this first review, I’d like to take this opportunity to introduce this new series of posts that will highlight the new anime lineup of the fall 2016 season. It’s with great pleasure that I attempt to bring to the table some fresh editorials on some (or most) of the upcoming shows with potential to stand out as staples to the anime community. Without further adieu, I give you our first anime report, beginning with Nobunaga no Shinobi. 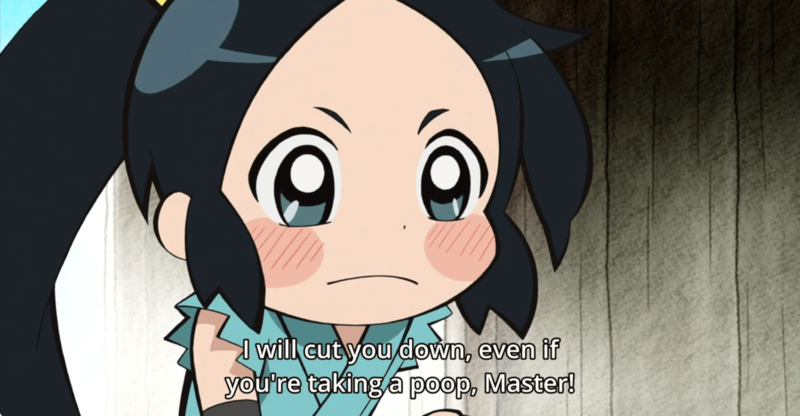 This episode kicks off the beginning of a series of shorts based on a four panel manga strip that details the adventures of a young ninja named Chidori, who has been commissioned to work under Oda Nobunaga, a famous fuedal lord of the Edo and Meiji period. 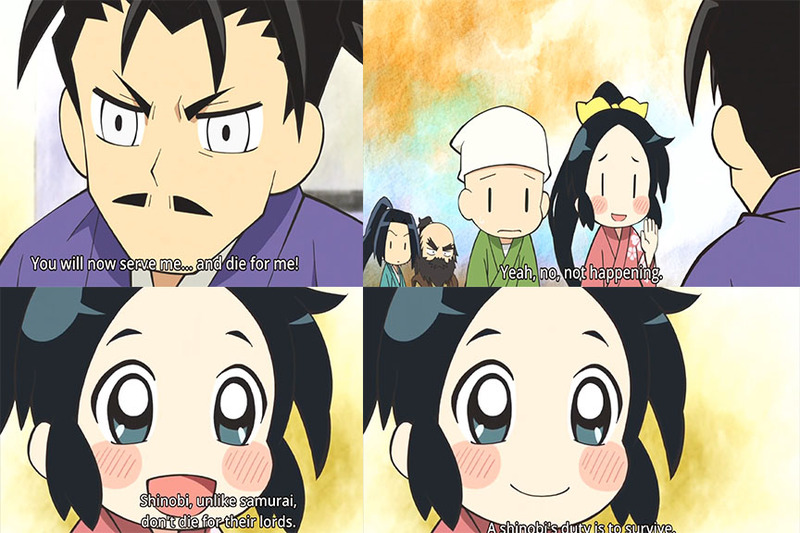 Based loosely on historical facts, Nobunaga no Shinobi embellishes the past in an effort to make it’s audience smile. With a cutesy character design, and wonderfully bright color palette that lends a lighter side to the stories of Japan’s background. The opening theme is nothing to brag about, but there’s something to be said about producing a cutesy feel to a bloody massacre. Way to go, Chidori! Each episode is about 4 minutes long, but the series already starts off on a promising note with it’s first episode. In it, we learn about Chidori’s first encounter with Nobunaga where he saves Chidori from drowning. Some time later, Chidori is determined to serve under Nobunaga’s reign and venture forth, with help from Suzekou (her childhood friend, who also has feelings for oblivious Chidori). I, personally, look forward to these pleasant episodes as I follow more of this fall anime season’s releases. Stay tuned for more first impressions and reviews on 8bit Waffles!